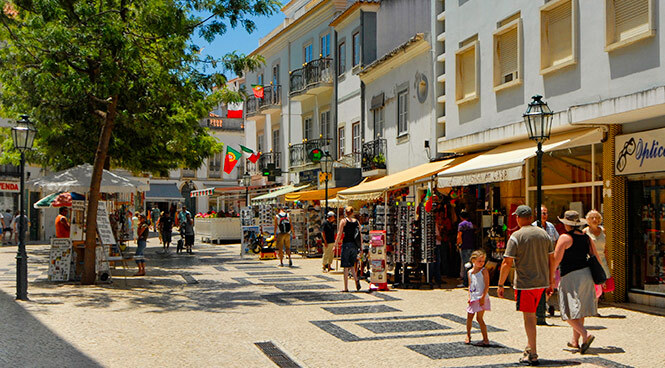 Lagos is the third largest town in the Algarve and a great destination for your villa holdiay. The railway station is just behind the Marina and you are just 90 minutes from Faro Airport by train. Today the Marina is the heart of the town. It has excellent facilities and now has the coveted 'Blue Flag' and 'Euromarina Anchor' status. It attracts visiting yachtsman from all over the world. The Marina is the place to go for a quiet drink as the sun sets on Lagos. The town is very lively in the evenings with a carnival atmosphere attracting a young international crowd. The pedestrianisation of the town centre has been a major success, and you can enjoy wandering from your villa around narrow, traffic-free streets looking for history and culture. If you want a fabulous view of the whole area, you can climb up the bell tower of the Igreja do Sao Sebastiano. There is plenty to do in Lagos, but if you want to get away from the bustle, try taking a bike ride into the mountains for some stunning scenery. The old town just behind the Marina is where you should head for clubs, bars and night-life. There are some fabulous beaches within easy reach of Lagos. If you want a small local beach with marvelous caves, coves and grottos to explore, try Praia da Batata, Praia do Pinhão, or Praia Dona Ana. The water here is wonderfully clean and clear, perfect for snorkelling. Porto Mós is a long wide beach of clean white sand and stunning cliffs, sheltered from the north wind. This is the place to see a glorious sunset! To the east of Lagos you will find one of the largest bays in Europe, Meia Praia. This vast beach never feels crowded even in mid-August, despite the large number of both visitors and locals who come here to relax. It is very safe with Blue Flag status and a life guard, and there are all the usual amenities together with great views. When you want a bit more action to liven up your villa holiday, take to the water! Try a leisurely cruise in a sea kayak, or dolphin watching.